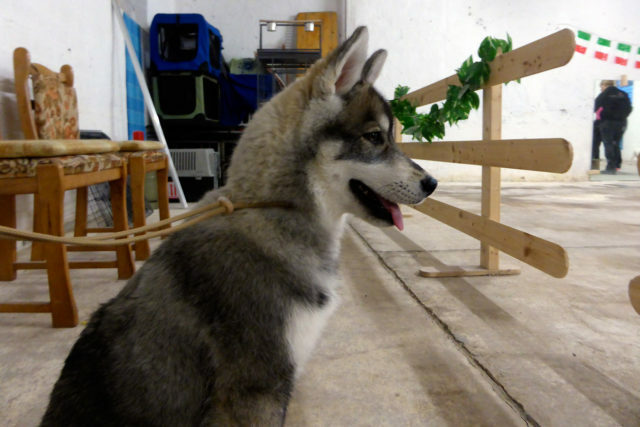 Last night, we and Kira and Nukka (Almudis of Kahnawake) took part in a conformation training with Tanja Backes. While Kira is familiar with training for shows, everything was new for Nukka. She was very excited, yet joined in nicely. I did not ask much of her, but gave her a playful first lesson. And all the other participants just shrugged off the hassle a pup brings up. All of us once started with a baby dog. En passant, my husband turned out to be a natural doghandler. Well, I suspected that all the time. Thank you, Tanja, for your support!